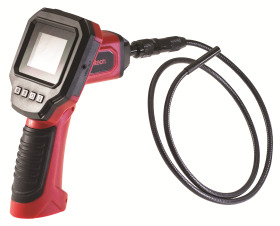 The new Amtech 2.4-inch LCD Inspection Camera (stock code S2310) is a highly-versatile tool, which allows the user to conveniently view inaccessible areas, such as pipes and drains, as well as, ventilation shafts, engines, cavity walls and under floors. The product is packed with key features and benefits, including a 1m IP67 rated reinforced flexible camera tube, an adjustable backlit LED screen and four in camera tube SMD LEDs. In addition, a VGA video output allows for displaying content on a PC, Laptop or TV with 640 x 480 pixel resolution. It’s also supplied with an accessory pack which includes hooks, a magnet and mirror, as well as, a user manual and handy storage case. Supplied with three-year guarantee.